At the mere age of 11, Sam Barrow, Founder of Squidix, got his hands on a copy of Visual Basic from his Father. His interest in technology, including computing and programming, sparked his desire to learn more and more, feeding his hunger to teach himself new skills. “I got a hold of a copy of Visual Basic. By the next day, I had programmed an educational game for my younger Brother”. Sam’s interest in servers began “when web programming and web based applications started to dominate the landscape”, he says. Sam’s passion for web hosting transpired naturally; in 2010 he was running multiple servers for his own projects where he picked up his first client. As he already had the hardware, he figured why not, what’s there to lose? In our interview, Sam confirmed “By the way, that client is still with us today!”. A great testament to his commitment and passion for Squidix. For Sam, technology and automation isn’t just about speed – it’s reliability, and that’s what really sets Squidix apart from so many other web hosts. “Computers don’t make careless mistakes”, Sam says. “We have done a lot at Squidix to automate our processes, from order provisioning, invoicing, and custom server deployment”. Squidix are entirely open and honest, and can back-up their performance guarantees with regularly updated real-time data through their network status. Their performance monitoring refreshes every 60 seconds to give Squidix’s users data that they can rely on. So many web hosts offer an uptime guarantee, but how many can you name that display their data in such a way that Squidix does – we really love this aspect. Their 99.9% uptime guarantee is clearly honoured. Their stats are refreshed every 60 seconds. For Sam, Squidix’s initial focus was to provide hands-on support for clients that needed help with their website in general. “Our clients were mostly from other companies who refused to help them with their web site’s code itself”. This unique approach has created Squidix as it is today, providing commodity style hosting, with website repair and maintenance services should their clients require them. Sam confirms, “we try to be a one stop shop for our clients’ web site needs”. Squidix offers their customers 5 hosting packages, including shared hosting, semi-dedicated hosting, reseller hosting, managed VPS hosting, and managed dedicated servers. With the introduction and massive growth of applications like WordPress, Joomla, and Magento, website building has never been easier. We are now in a position where webmasters don’t have to sit in front of their computers staring at, and learning code to design a professional looking website. This has also caused the web hosting industry to expand into much more than just web hosing. “I’ve always enjoyed hosting. It’s multi-faceted, you’re dealing with networking, servers and often web development too. Beats just writing code all day”, says Sam. Squidix have flawlessly encapsulated everything you could need from a web host. They understand that some users feel website builders are a better product for them, over hiring a web developer. But they also get that some webmasters still enjoy the hard-coding aspect of designing and developing a website, with their developer friendly options. Regardless of whether users are using Squidix’s 1-click installations, or developing their websites from scratch, their focus on providing a uniquely dedicated support system is still at the forefront of their brand. What drew us to Squidix in the first place was the wide approach that this web host takes within the industry. Yes, they offer very competitive hosting plans, but they don’t just stop there – they pinpoint issues on a larger scale. Squidix have tackled problems in the market that other hosts perhaps haven’t considered, or simply haven’t focused on as a niche area. Take their spam filtering feature for starters; as well as using popular software like SpamAssassin, Squidix have also been working on filtering all outbound emails through MailChannels. Sam’s view is that if he has experienced a problem, then it must be tackled, as others must experience it too. This is a prime example of how his web hosting company set themselves apart from the competition. Continuously driving change in modern technology, and fixing real problems that users experience on a daily basis. 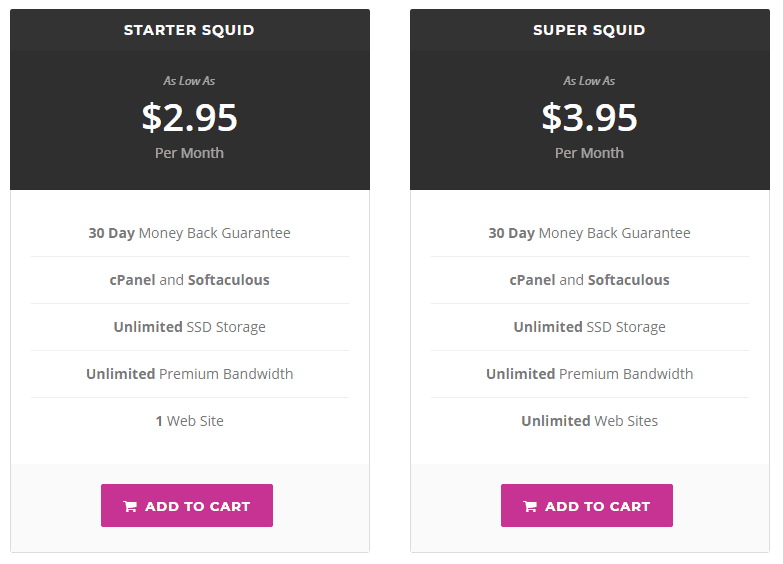 From as little as $2.95 per month, Squidix customers have access to all the features outlined, for free, plus unlimited storage, bandwidth, and 1 website. And if for any reason you’re not happy with that, they offer a 30-day money-back guarantee. Their general approach and attitude is certainly something to admire, as well as the products and services they offer. It’s a refreshing change to experience a web host who do so much more than ‘what’s on the tin’. Speaking to Sam was a breeze; he was very open to us interviewing him and digging deeper into the birth of Squidix. It’s often easy to forget that companies don’t just appear; hard work and innovation is applied with someone sitting behind it all, creating a driving force to success. Whether you’re a newbie looking to build and host your own website for the first time, an experienced user, or a webmaster, Squidix has something to offer for everyone. You’re getting a complete package, not just web hosting. We asked Sam if he had any further plans for the future in the world of technology. “Mostly just growing Squidix! But we are working on a SaaS cloud based help desk application right now. We’ll be releasing that in 2018”. With exciting things to come from Squidix founder, Sam Barrow, we wish him lots of success – he most certainly deserves it, and isn’t afraid to share or reach out to other professionals and techies along the way.